Kombucha Mushroom Tea is a Raw Active Continuous Process. Like a chicken egg that hatches because the time and temperatures are in their proper relationship. Wine is made with yeasts. Vinegar is made with bacteria. Separate process's. Kombucha Tea is made with both yeasts and bacteria in a synergic process. Once this process reaches the precise stage we seek, we then bottle to maintain that stage—or serve a refreshing elixir as is. A lot of research on Kombucha Tea identified Kombucha Tea as a process of fermentation by yeasts and bacteria, sugar and black tea (camellia sinensis, oxidized / fermented). There is a finite number of yeasts and bacteria combinations that will produce kombucha. The many possible combinations as well as synergy of various strains of kombucha tea possible have lead one major kombucha researcher (Michael Roussin) to conclude that Gluconic Acid, Acetic Acid, and fructose are what is in All Kombucha Tea. The taste and character of the Kombucha Tea is only partly formed by the type of tea used in the ferment. Tea contributes tannins, nitrogen and to a lesser extant caffeine hat both the yeasts and the bacteria rely upon to create Kombucha Tea. The composition, character and preparation of the tea affect the peculiarities of the Kombucha Tea. The most common sugar used for kombucha mushroom tea is normal table sugar. White Sugar. Sucrose. The yeast cleave the sucrose into fructose and glucose. The yeast need glucose to survive underwater. Alcohol is produced as a by-product. The bacteria prefer alcohol but require glucose to produce the cellulose (SCOBY, Mushroom). How fast the sugar is metabolized into glucose plays a large role in the overall time of the ferment. Regardless of how long we ferment, some fructose and some unfermentable sugars will remain. That level can be measured as "Residual Sugar". That percent not converted to glucose remains behind largely as fructose and various nutrients. Some contribute to taste. Fructose is sweeter than glucose. Minerals, such as in organic sugar, create a slightly bitter taste. Other components of the peculiar sugar we use affect taste as well as the formation, creation and destruction of acids. There are many fermentable sugars, another popular one is Dextrose. Honey and syrups will ferment. Fruit and Fruit juices will ferment. All leave different impressions. refer to our article on SUGARS. Generally, the conversion of sugar to alcohol is complete within 7-10 days when fermented at 21C- 27C (74F - 84F). A “hot fermentation” for instance in some red wines, may be at higher temperatures 27C- 30C (80-85F). note: these two temperature ranges are what we recommend your fermenting temperature range to make Kombucha Tea, i.e., 74-85F. Why choose one over the other or what is happening at what temperatures is our quest. The lower range produces a thin light crisper brew, while the upper range produce a heavier, thicker more yeasty brew. In the pursuit of Kombucha Tea, we are neither making wine – which almost exclusively rely upon yeasts, nor vinegar, which rely almost exclusively upon bacteria. We are making Kombucha Tea, which is a Serendipitous Collective adventure Of Bacteria and Yeasts, - SCOBY. The tea that we drink is but a Kodak Moment. Yeast work fastest at about 1-2% sugar concentration. High sugar levels actually retard the growth of yeast; Initial concentrations above 25% are problems. To make the strongest possible elixir increase the sugar gradually. For example adding 1/3 on Day 1. 1/3 on Day 2, and the final 1/3 on Day 3. If you use a Hydrometer, add sugar at 1.040, bringing ferment up to 1.060-65, let it go until 1.040 add sugar again up to 1.060 and so on until you've added the sugar you want. Acetic acid taste like/is vinegar. We can easily test the pH of our ferment. The pH does not give us the actual acetic acid level, but the whole acid level including the crucial Gluconic Acid. However it may also include such acids as; Lactic acid, Citric acid, Oxalic acid, Itaconic acid, which are more commonly found, and some more random acids like; Benzoic acid, Butanoic acid, Decanoic acid, Hexanoic acid, Nicotinic acid, Pantothenic acid, Propionic acid, Octanoic acid, d-Saccharic acid, Glucaric acid, Succinic acid, and always the ~Keto-gluconic acid, (2-Keto-gluconic acid, 5-Keto-gluconic acid, 2-Keto-3-deoxy-gluconic acid) which may have been confused for what was reported as Glucuronic Acid in Kombucha Tea). For properly fermented and anti-microbial effect, the Kombucha Tea should be fermented to a pH in the range of 2.5 – 3.0 +/- with around 33 g/L total acids. (according to research by Cornell University).To be safe according to the Pickle Bill a ferment should be under 4.0 as measured by a pH meter. Kombucha Tea is made by yeast that is acid tolerant, The principle role of the yeast is to convert the sugar into ethanol (alcohol) for the bacteria to feed upon. To a lesser extent to produce carbon dioxide to make our Kombucha Tea sparkling and effervescent – without suffocating the bacteria which require oxygen. Yeasts provide a portion of the taste of Kombucha Tea. Some species of yeasts can convert sugar into both alcohol and acetic acid, but not produce gluconic acid by itself. One species of yeast isolated from Kombucha Tea has been identified as Zygosaccharomyces kombuchaensis sp. n. (type strain NRRL YB-4811, CBS 8849) this species seems unique to Kombucha Tea. The growth rate of yeast is normally related to temperature. While most yeast will survive cold temperatures, growth rate is very slow and species dependent. In general optimum yeast temperature range is 16C – 30 C [60-85F]. Lower temperatures are difficult to handle and can lead to increased levels of S02, volatile acid and hydrogen sulphide and some bad smelling stuff. Additionally at low temperatures, the beginning kombucha ferment is very susceptible to pathogens and foreign or domestic yeasts that may attempt a takeover over the chosen yeasts that has yet to establish itself, or has gone dormant because of the cold allowing another species better suited to cold temperatures to take command. Temperatures above 35C [95F] will usually stick [stop] most fermentation. At 41C [105F] most yeast begin to die off and at 140F yeast dies within a few minutes. My research indicates that the most common range is 23C - 29C [74F - 84F] and is fairly easy to maintain in the average household. Kombucha heating units or seedling trays are encouraged by kombucha authors and researchers like Harald Tietze and Guenther Frank and myself. A regulator can be added to help maintain ideal temperatures. A kombucha ferment that does not produce a mushroom, or a very quick acetic tasting ferment (faster than its normal production), or a normal ferment with very thin and opaque mushroom is probably due to the demise of the kombucha bacteria. This may be because the yeasts have produced an intolerable amount of alcohol for the bacteria to survive in, and /or an intolerable amount of carbon dioxide and the bacteria have suffocated. The bacteria need oxygen as do the yeasts in part of their ferment. Boiling water or distilled water or very hot temperatures all reduce the available oxygen. Stirring the water well before starting helps increase oxygen levels. Stirring during the active ferment will increase oxygen as well as disturb the growth of the cellulose (mushroom). In this case stirring/disturbing the cellulose does not adversely affect the formation of the acetic or gluconic acids, you’ll just have an ugly or thin mushroom. Another cause may be due to the rise of dormant specie within the kombucha or to outside influences - wild and airborne bacteria or yeasts, soaps, harsh sunlight, smoke, paint fumes, or neglect of sorts. Not all species of Acetobacteraccae produce a mushroom but all will produce acetic acid. Our other major player in our serendipitous adventure is the bacterium. Its role is to produce the beneficial acids and to reduce the sugar and alcohol content. To avoid an over-bearing straight vinegar drink we need to maintain a higher ratio of gluconic acid to acetic acid. This produces a pleasant semi-sweet, semi-sour elixir known as Kombucha Tea. In a basic home ferment the starter tea contains both the yeasts and the bacteria (from a precious batch) and a kombucha mushroom (the DNA). When the feeding solution is added (sugar and camellia sinnesis,) the yeasts begin an active ferment. Depending upon he type of sugar selected, the bacteria compete with the yeast for available glucose. Usually the bacteria have to wait for the enzymes that the yeasts produce to break down the sugar into glucose and fructose. As the yeasts commence producing alcohol the bacteria begin feeding on the alcohol converting it into beneficial acids and nutrients. The bacteria also begin the cellulose production (mushroom) in an attempt to seal off "its" food supply. As you'll see in the charts below, too much alcohol will destroy the bacteria. And too much carbon dioxide (also produced by the yeasts) will suffocate the bacteria who require oxygen. In a commercial venture these two steps can be done completely separate. Our Home-Brew however is really a dance, as one partner moves, the other partner glides. You are the conductor of the great symphony that the yeasts and bacteria dance to thus creating a mystical elixir and a magical moment. All research indicates that specific strains of Acetobacteraceae are responsible for both the acetic acid and the gluconic acid that create Kombucha Tea. A few members of the family Acetobacteraceae are cellulose-producers, while only six members fix nitrogen, a component found in tea as well as other herbs. (see herbs for fermenting kombucha) One strain isolated in Kombucha Tea has been identified as Gluconacetobacter kombuchae sp. nov. (RG3T (=LMG 23726T=MTCC 6913T). RG3T does both as well as produce cellulose (kombucha mushroom). According to Michael Roussin the mushroom contains the “DNA” of the ferment, the instructions and expectations to be followed to maintain the strain. Although this seems far-fetched we’ll present some research below that indicate that certain behaviors are developed specific to this life-force known as Kombucha Tea. The state of health of the bacteria and thus the health of the Kombucha ferment is reflected in the size and texture of the mushroom. One strain of bacteria Lactobacillus camelliae sp. nov. (lactic acid bacteria isolated from fermented tea leaves) is heterofermentative: produces 50% lactic acid and considerable amounts of ethanol, acetic acid and carbon dioxide but not gluconic acid. The yeasts in Kombucha Tea secrete an enzyme which cleave the sugar into glucose and fructose and the yeast then produce ethanol and carbon dioxide. The acetic acid bacteria create alcohol dehydrogenase and aldehyde dehydrogenase. If the bounds of aldehyde dehydrogenase are over stepped we get some pretty foul smelling Kombucha Tea. If everything is as it should be we obtain acetic acid, gluconic acid, some fructose and a very tasting, pleasant healthy elixir – the Tea of Immortality as the Chinese referred to it. Part II Temperatures and the Production of Acetic & Gluconic Acid. Eighty-six samples including 35 from fresh fruits, 24 from flowers, 14 from rotten fruits, six from soils, five from wine with dregs and two from the wood of fruit trees were used to isolate acetic acid-producing bacteria. Sixty-nine strains of acetic acid-producing bacteria were obtained, 21 from fresh fruits, 11 from flowers, 28 from rotten fruits, one from soil, three from wine with dregs and five from the wood of fruit trees. 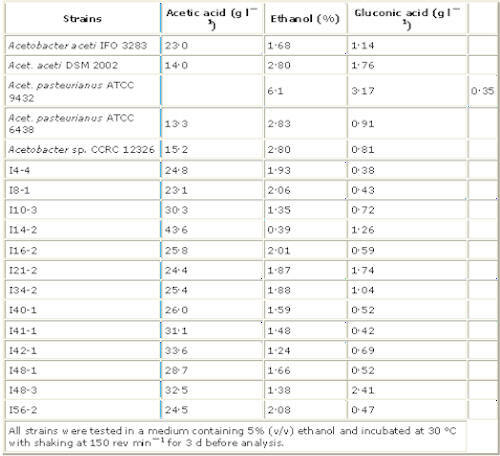 The abilities of the tested isolates to oxidize ethanol to acetic acid in a medium containing 5% ethanol are listed in Table 1.
used as reference strains in the Charts below. Optimum temperature of acetic acid production was determined by incubating the isolate at various temperatures and the residual activity of acetic acid production in each sample was compared with the control sample which was cultured at 30 C. [86F]. 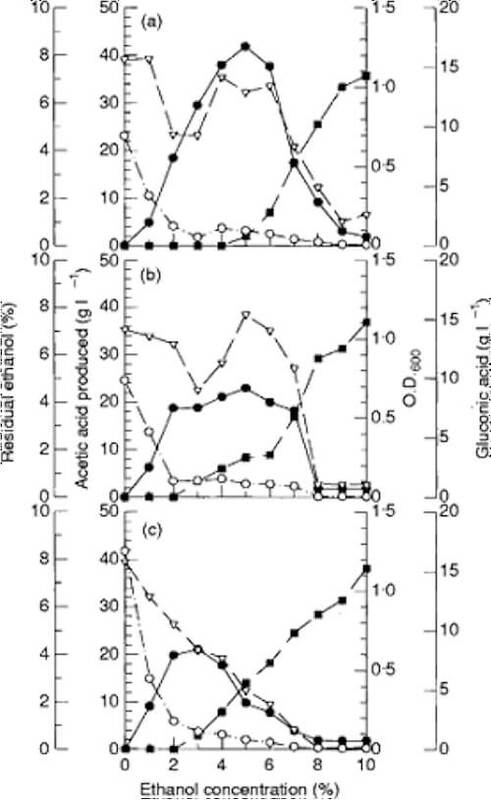 In the time course study of acetic acid production from ethanol by isolate I14–2, it was found that acetic acid accumulation paralleled cell growth (Fig. 1). Ethanol was consumed steadily until cell growth reached stationary phase after 3·5 d of cultivation, whereupon acetic acid accumulation reached a maximum level of about 50 g l [if !vml] [endif] 1. 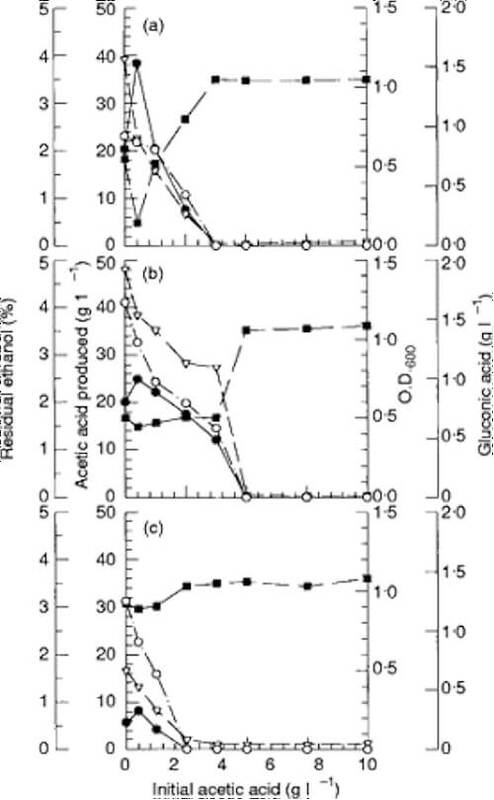 It was found that gluconic acid formation occurred during the log phase along with acetic acid accumulation, and no further production was observed during the stationary phase. …. Gluconic acid production by these three strains was inhibited steadily by increasing initial acetic acid concentration. This indicates that gluconic acid formation is repressed either by acetic acid added initially and produced during fermentation, or by low pH caused by acetic acid…. ………….. The optimum ethanol concentration for acetic acid production was 5% …The production of gluconic acid,… reached the highest level in a medium without ethanol addition. …. Acetobacter would oxidize glucose to gluconic acid when ethanol is absent, but would prefer to use ethanol rather than glucose when ethanol is present. … over a temperature range from 20 to 37 °C (68F – 98.6F). with an optimum at 30 C. [86F] (Fig. 4a). ….The effects of temperature on gluconic acid production and cell growth were coincident in trend with acetic acid formation. In this study, Acet. aceti IFO 3283 and Acetobacter sp. 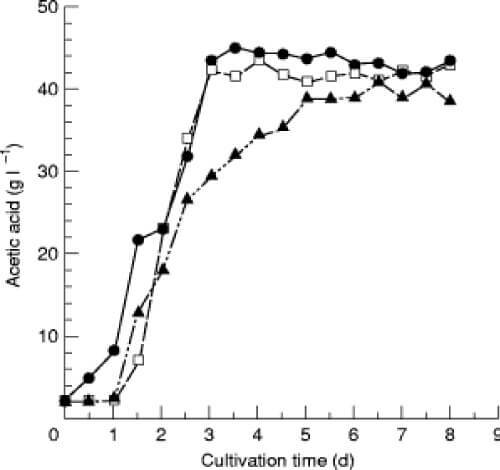 CCRC 12326 did not grow or produce acetic acid when they were incubated at 35 C. They had an optimum temperature for acetic acid production at 30 and 25 °C, respectively (86 - 77 F) (Fig. 4b,c). When the temperature was raised, a delay in ethanol oxidation was observed. The lag period for acetic acid production from ethanol by Acetobacter sp. I14–2 was prolonged to about 24 h at 35 and 37 C (Fig. 5). However, ethanol was completely exhausted in 3–4 d and acetic acid production reached almost the same maximum level when incubated at both 30 and 35 °C. Although the consumption of ethanol at 37 °C was obviously delayed, isolate I14–2 could still produce 41 g l [if !vml] [endif] 1 of acetic acid. The decrease in amount of acetic acid produced might be caused by ethanol volatilization at a higher temperature. ….. Acetobacter sp still actively produced acetic acid when it was cultured at 35 C [95F]. and 37C [98.6 ] for 3d, and retained about 97 and 68%, respectively, of the activity compared with that at 30 C. [86F]. The same result was observed for ethanol consumption by Acetobacter sp. the lag time was prolonged when the temperature was elevated to 35 [95F]. and 37C [98.6 F] (Fig. 5). The yield of acetic acid from ethanol by Acetobacter sp. was 95% after incubation at 30 C. [86F] for 3·5 d. In comparison, the usual yield of acetic acid by acetic acid bacteria ranges from 60 to 98% (Bar et al. 1987). The yield of acetic acid by Acet. altoacetigenes reached 92% after 5 d of fermentation (Entani et al. 1987). Acetobacter aceti and Gluconobacter oxydans subsp. sphaericus exhibited 80 and 92% yields, respectively (Bar et al. 1987; Saeki 1993). Acetobacter sp. which could grow well at a wide temperature range of 30 C. [86F] - 37 C [98.6F], showed a yield of 95% (Lotong et al. 1989). The yields of three thermophilic strains, were about 87·5% at 30 C. [86F] (Ohmori et al. 1980). However, the yield of strain no. 554 was very low at 37 C, and strain S-30 had lost its ability to produce acetic acid at 35 C. Acetobacter sp. expressed an outstanding thermotolerance with a yield of 85 and 82% when it was cultured at 35 and 37°C, respectively, for 6 d. The yield at 37 °C by Acetobacter sp. I14–2 is comparable with that of Acet. lovaniensis SKU 1108, a thermophilic bacteria (Saeki et al. 1997). Acetobacter sp. I14–2 generated acetic acid at a rate of 0·61 and 0·59 g l [if !vml] [endif] 1 h [if !vml] [endif] 1 at 30 and 35 °C, respectively., the acetic acid production rate of Acetobacter sp. I14–2 at 30 C. [86F] was comparable with those of some thermoplilic strains such as Acetobacter sp. no.550, 554 and S-23 (Ohmori et al. 1980). In addition, the production rate at 35 or 37 °C was higher than that of a protoplast fusant strain, no. 116, which possessed a high resistance to acetic acid and ability to grow at high temperatures (Fukaya et al. 1989). The reasons for thermostability of thermophilic strains are still uncertain. Ohmori et al. (1980) suggested that the increase in tolerance to acetic acid or ethanol might account for their thermophilic properties. Saeki et al. (1997) studied the stability of aldehyde dehydrogenase and alcohol dehydrogenase, but they did not find any significant differences between thermophilic and mesophilic strains. We considered that tolerance to acetic acid or ethanol did not contribute to the thermotolerance of Acetobacter sp. I14–2 as there was no remarkable increase in tolerance to these compounds. Further studies are needed to elucidate the increase in stability of enzymes, or the change in membrane structure in Acetobacter sp. I14–2, which might account for its thermostability. Some authors have reported that several thermophilic strains lose their acetic acid resistance and ethanol oxidation capability in the stationary phase (Ohmori et al. 1982; Takemura et al. 1991), but it was not observed in Acetobacter sp. I14–2. With the advantages of thermotolerance, resistance to ethanol, high acetic acid productivity, and easy preservation by lyophilization, isolate I14–2 is suitable for vinegar making. Changes in major components of tea fungus metabolites during prolonged fermentation. Changes in major components and microbes in tea fungus broth (or kombucha; teakwass) prepared from nine different sources during a prolonged fermentation of up to 60 days were investigated. Cell concentrations of both yeasts and acetic acid bacteria in broth were generally higher than those in the cellulosic pellicles. 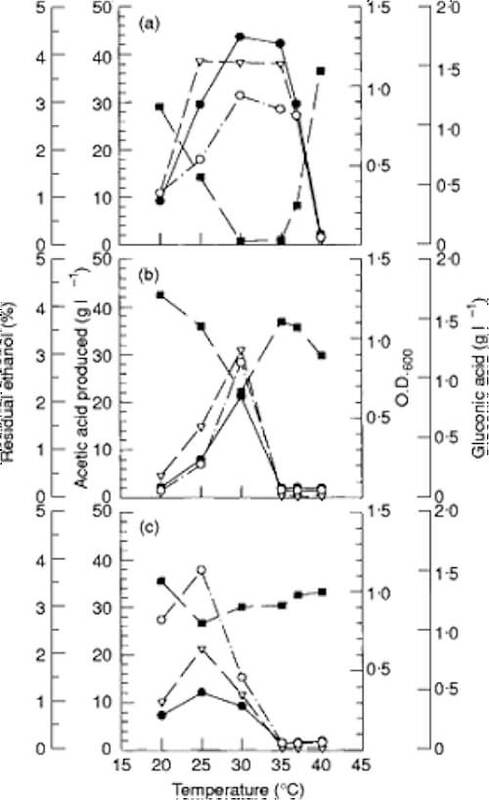 The residual sucrose concentration decreased linearly with time, although the rate fell after the first month. Metabolic fates of glucose and fructose produced as a result of the hydrolysis of sucrose were different. Glucose was not produced in parallel with fructose (0.085 g 100 ml(-1) d(-1)) but was produced with a lower initial rate (0.041 g 100 ml(-1) d(-1)). Both titratable acidity and gluconic acid increased steadily with time for all samples, although gluconic acid was not generated for 6 days until the fermentation had begun. Acetic acid increased slowly to a maximum value of 1.1 g 100 ml(-1) after 30 days; thereafter, it decreased gradually. Gluconic acid contributed to the titratable acidity and thus, the taste of tea fungus broth, during the final stage of fermentation. It is concluded that the desired quality or composition of kombucha can be obtained through the proper control of fermentation time. Both MOV and kombucha use Acetobacteraccae (bacteria) and yeast to ferment. Not all Acetobacteraccae produce a mushroom (cellulose), but they all produce acetic acid. It is more typical for Vinegar to be produced with one of those non-cellulose producers and therefore MOV is less formed (aggregates suspended in the culture) more ball like thing floating submerged. Commercial production is after the acetic acid, not the gluconic acid or cellulose which detract from acetic acid production. Normal vinegar production is 5% or higher acetic acid, while kombucha ferments rarely goes above 1% acetic acid, maybe a rare 3%, but then declines over longer time. It may be the sugars are different (ACV = apples = fructose, kombucha = glucose) where kombucha with fructose produces almost all acetic acid and little, if any gluconic acid (Guenther Franks “Kombucha its Correct Preparation and Use…). More and more commercial vinegars are not fermented as in days of old, (Four Thieves, Balsamic, Braggs Apple Cider Vinegar) and rely only on the second stage (bacteria) feeding on added alcohol (plus flavors ...). The studies (as above) are for the the maximum acetic acid potential. However, our interests are in the full fermentation. The yeasts play a significant role - even though they are not absolutely mandatory (one could use watered down gin). However the studies are important to the of zymurgy kombucha tea. From these studies we better understand the Time and Temperatures and Influences of our home Kombucha Tea ferment our SCOBY. Within the family Acetobacteraccae, of the select few who produce cellulose only six members fix nitrogen, a component found in tea (camellia sinnesis). Thus you have the makings of kombucha: a cellulose paddy (mushroom), tea (not apples), acetic acid, and gluconic acid and fructose - Kombucha Tea. Wine brewers want high alcohol content. Kombucha brewers want high Gluconic acid, decent acetic acid and as complete reduction of alcohol as possible. Hopefully this presentation will help home brewers chart their own course. from Journal of Applied Microbiology 86 (1), 55–62.